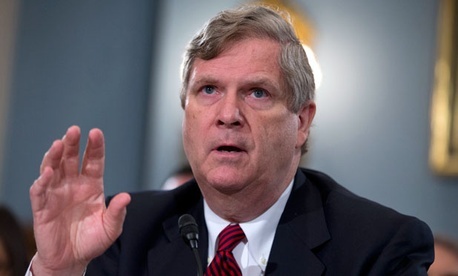 Two agencies within the Agriculture Department are facing possible furloughs, according to testimony Secretary Tom Vilsack delivered to Congress this week. Employees at the Farm Service Agency and Rural Development division could be forced to take up to 10 furloughs days, Vilsack told members of the House Appropriations’ agriculture subcommittee. Vilsack said sequestration on top of a 2.5 percent cut to the Agriculture budget in the continuing resolution could necessitate unpaid leave, despite efforts to improve efficiency at the department. Two years ago, Vilsack said, USDA instituted its Blueprint for Stronger Service, which cut travel, closed offices, reduced the workforce and deployed early retirement incentive programs. Steve Hollis, a local president for the American Federation of Government Employees who represents employees at FSA and Rural Development, said the testimony came as a surprise. Hollis told Government Executive he is in negotiations with FSA, but had heard the maximum furlough time was only five days. That information, however, came before Congress passed the latest continuing resolution -- which included an additional 2.5 percent cut to Agriculture’s budget. Hollis said he was not aware furloughs were a possibility at Rural Development, noting the agency has shed 3,000 employees during the past few years and officials had indicated unpaid leave would be avoided. He added it was unfair to target those two USDA agencies in particular. At the subcommittee hearing, Vilsack said he had “very little flexibility” in implementing sequestration. “We are not able to do this without making some very difficult decisions,” he added. Rep. Rosa DeLauro, D-Conn., said her colleagues in Congress did not fully grasp the impact of sequestration and other budget cuts. “I’m not sure there is the granular understanding of what this means in reality to the population of people you’re talking about,” DeLauro told Vilsack. Another USDA agency that avoided furloughs under the continuing resolution was the Food Safety and Inspection Service, which received supplemental funds so meat inspectors could continue their work uninterrupted.